Lung cancer occurrence throughout the world and its unsatisfactory treatment has drawn significant attention from many medical agencies. A genomic approach utilizing siRNA against target gene may resolve this problem. Present investigation includes siRNA lipoplex formulation and its in-vitro characterisation in lung cancer cell line for intracellular uptake and cytotoxicity. Accumulation of siRNA inside the cell as well as less cytotoxicity of prepared carrier system signifies potential of prepared siRNA lipoplex in the treatment of lung cancer. Cefuroxime Axetil nanoemulsion was formulated to address the problem of poor oral bioavailability. Formulation was manufactured utilizing Capmul MCM, Soya lecithin, Deoxycholic acid, Pluronic F127 and distilled water. Mean globular size of 121.3 nm was obtained. Drug content of nanoemulsion was found to be 97.12±0.27% w / v . 80.7261% of the drug was diffused from nanoemulsion, as compared with 51.0048% diffused from the plain Cefuroxime axetil suspension. 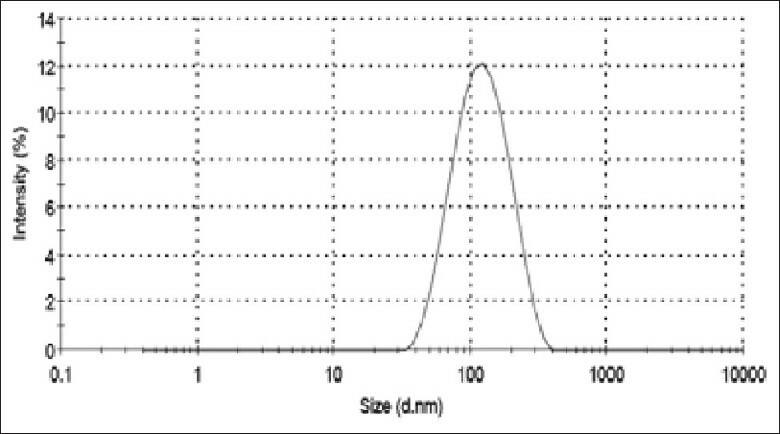 In vivo studies indicated AUC 0-24 : 325.3 for nanoemulsion in comparison to AUC 0-24 : 165.3 for plain suspension. Therefore a good orally bioavailable formulation was developed successfully. In present investigation, novel physiologically activated phase transition systems for Ketorolac Tromethamine was developed. In-situ gelling systems: pH sensitive gel using carbopol 980 and HPMC K100LV, ion sensitive gel using gallan gum and temperature sensitive gel using Poloxamer 407 and Poloxamer 188 were developed. The drug content, content uniformity, pH, optical transmittance, rheological property, bioadhesive strength, in-vitro drug release, ocular irritation and stability study were evaluated. Characterization revealed that gels were conforming to all criteria required for ocular delivery in terms of stability on sterilization, long residence time, non-irritability and sustained drug release without affecting vision. Thus, In-situ gels can be a promising alternative to the prevalent market formulations. Floating microspheres are multiple unit Gastroretentive drug delivery systems. Valacyclovir hydrochloride (VCH) is L-valyl ester prodrug of acyclovir. VCH degrades in intestinal fluid. The objective was to develop floating microspheres of VCH to localise the drug at upper part of GIT, for improved absorption. Floating microspheres were prepared by W/O emulsification solvent evaporation method using Ethylcellulose (EC) as polymer. Particle size and % EE were 550.021±0.241 μm, 79.88±2.236% respectively. in vitro and in vivo floatability studies confirmed floating behaviour of microspheres. VCH loaded floating microspheres can be a suitable alternative to the conventional formulation, by localizing the drug at upper GIT. NSAIDs are among the most widely used prescription drugs, for the treatment of pain and inflammation, particularly arthritis. Inhibitor of COX and NSAIDs relieve the signs and symptoms of inflammation by decreasing PG production but may cause GI and renal damage. Synthesis, stability studies and Y-imaging studies are carried out. Cartilage targeting strategy for conventional NSAIDs has been explored for reducing their local and systemic side effect of the NSAIDs site specific delivery of quarternary ester derivatives could have to be an effective strategy for long term therapy of inflammatory conditions like arthritis. Arthritis is a heterogeneous group of conditions that leads to joint symptoms and signs which are associated with defective integrity of articular cartilage. Major classes of drugs which are widely used for the treatment of arthritis are Non-Steroidal Anti-inflammatory Drugs (NSAIDs). Development of an efficient means of percutaneous delivery can increase drug concentration in local soft-tissues and joints while reducing the systemic distribution of a drug and its side effects. The present work is aimed at synthesisand evaluation of prodrugs of some NSAIDs for percutaneous drug delivery for the treatment of arthritis. The objective of this study was to increase the oral bioavailability of Raloxifene having an absolute bioavailability only 2% due to extensive first pass hepatic metabolism by incorporating it in Solid Lipid Nanoparticles (SLNs). The optimized RSLNs prepared by Ultrasonic Emulsification and Low Temperature Solidification method showed the mean particle size, zeta potential and percentage drug entrapment of 101.4±3.5 nm, 19.4±0.279 mv, 97.67±1.02% respectively. The in-vitro intestinal permeability study indicated significantly higher permeation of the RSLNs than the marketed preparation. 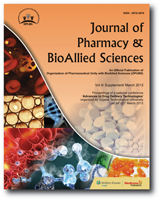 The in-vivo studies showed that pharmacokinetic parameters for the RSLNs were 3.5 times higher than the marketed preparation indicating significant increase in the oral bioavailability of the Raloxifene. Despite its strong antitumor activity, paclitaxel (Taxol® ) has limited clinical applications due to its low aqueous solubility and hypersensitivity caused by cremophor EL and ethanol which is the vehicle used in the current commercial product. In an attempt to develop a pharmaceutically acceptable formulation that could replace Taxol® , we have prepared PEGylated liposomes containing paclitaxel to improve its solubility and physicochemical stability. Its percent drug entrapment (PDE), mean particle size, zeta potential and in vitro release profile were determined. The optimized PEGylated liposomes provided high percent entrapment efficiency (64.29%) and mean particle size of 228.6 nm. The electroflocculation method showed 5 mol% of DSPE-mPEG2000 was required to obtain maximum stability for PEGylated liposome. In vitro release data showed its long circulating characteristic. 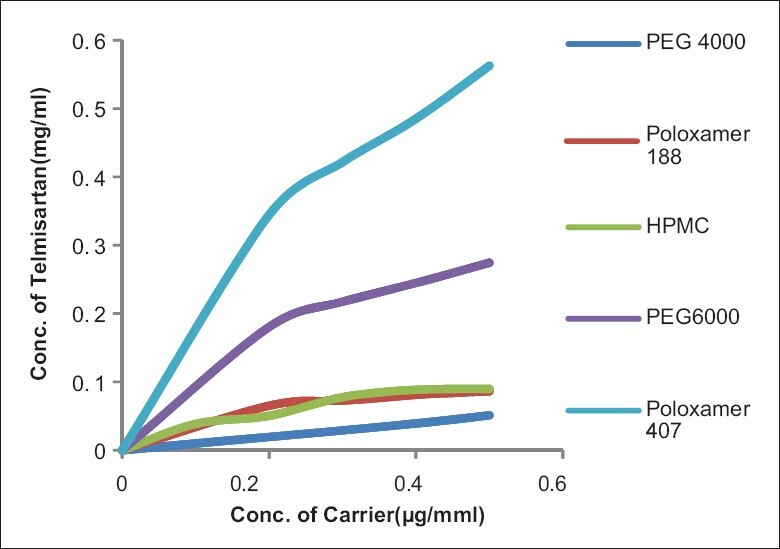 Paclitaxel loaded PEGylated liposomes can be considered a promising long circulating paclitaxel delivery with absence of side effects related to Taxol® . Quick dissolving film prepared by various grades of polyox like Polyox N10,N80, N750 and N205. Polyox having excellent film forming capacity with rapid hydration power which leads to rapid disintegration of film upon contact with saliva. Film is optimized for concentration of polymer and plasticizer using CCD design. The tensile Strength, folding Endurance, % drug released at 10 min (Y10) and disintegration time were selected as dependent variables. The data revealed that 2% of polyox N 750 and 15% of PEG 400 showed excellent film forming property with rapid drug release profile. The aim of the present work was to formulate a self-microemulsifying drug delivery system (SMEDDS) containing orlistat. The oil, surfactant and co-surfactant were decided based on the solubility studies. Pseudoternary phase diagrams were plotted, microemulsification area was determined and different formulations were prepared. Particle size, zeta potential, dispersibility test and thermodynamic stability studies were measured. In-vitro dissolution test of thermodynamically stable formulations OS-B and OS-C were carried and results were compared with those of plain drug and suspension formulation. Stability studies performed indicated that formulation OS-C remained stable over 12 months period. Thus this investigation concluded that hydrophobic drugs like orlistat can be delivered effectively through the formulation of SMEDDS. The aim of the investigation was to formulate Indomethacin Emulsion using Bio-polymer as Emulsifier. Different batches of emulsions were prepared by varying concentration of biopolymer prunus avium. Based evaluation of the prepared polymers, a conclusion can be drawn that in the Prunus avium bio-material can serve as a promising film forming agent for formulating various drug. The advantages of biopolymers over synthetic polymers are low cost, natural origin, free from side effects, biocompatible, bio-acceptable, environmental friendly processing, local availability, better patient tolerance as well as public acceptance. Sustained release tablets containing rifampicin was prepared by adding 100 mg polymer and 50 mg Drug and Granules. Same procedure was followed with 3% and 5% of polymer for preparation of sustained release tablets. Additional Tablets of 100 mg, 200 mg and 400 mg were prepared using 5% of the polymer. The results indicated that the selected biopolymer had a good release retardant property thus it can be concluded that the selected biopolymer can be utilized as low cost natural biocompatible and biodegradable agent. Indomethacin microparticles prepared by extraction of bio polymer from arachis hypogen. in vitro drug release study was carried out through egg shell membrane for 3 hrs and analyzed sample by UV spectroscopy at 320 nm. A novel bio membrane from arachis hypogen was isolated by simplify economical process. The % yield was found to be 80% and particle range was 32-65 μm. A new group of pharmaceutical excipients called cyclodextrins can be introduced into ophthalmology for delivering such water insoluble drug. This group of excipients is able to solubilize many water insoluble drugs which were previously impossible to be formulated as aqueous eye drop solution by forming their inclusion complexes. Analysis of pure drug and excipients by physical test, melting point determination, chemical test and solubility determination were carried out in this study. It may be concluded that cyclodextrin complexes of Natamycin can lead to an aqueous formulation (Natamycin eye drop) having better trans corneal permeability and thus can be proved to have faster and better antifungal efficiency. The intraocular patches were prepared using gelatin as the polymer. Ocular patch were prepared by solvent casting method. The patches were prepared for six formulations GP1, GP2, GP3, GP4, GP5 and GP6. Petri dishes were used for formulation of ocular patch. Gelatin was used as a polymer of choice. Glutaraldehyde used as cross linking agent and (DMSO) dimethylsulfoxide used as solubility enhancer. The elasticity depends upon the concentration of gelatin. 400 mg amount of polymer i.e gelatin gave the required elasticity for the formulation. The purpose of this research was to design, and evaluate multiparticulate systems for Chronotherapeutic delivery of beta blocker containing biodegradable polymers coated with pH sensitive polymers in hypertension. Chitosan was used as a carrier for drug delivery and Eudragit S100 was used as an enteric coating polymer. 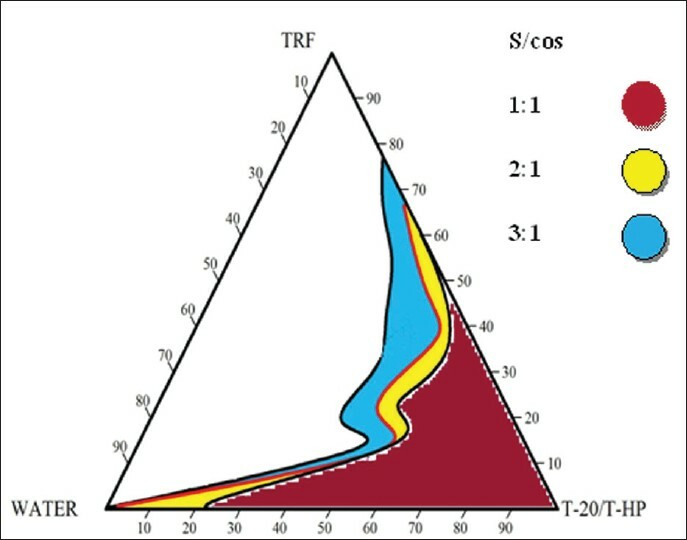 3 2 full factorial design was employed to optimize the proper formulation for Chronotherapeutic drug delivery. The aim of present research was to develop a fast releasing oral polymeric film, with good mechanical properties, instant disintegration and dissolution, producing an acceptable taste when placed on tongue. Solvent casting method was used to prepare oral films. Levocetirizine dihydrochloride, an antihistaminic was incorporated to relieve the symptoms of allergic rhinitis. The polymers selected were HPMC E 15 and PVA. Propylene glycol was the plasticizers used. Nine batches of films with drug were prepared using different combinations of polymers and plasticizer concentration. The resultant films were evaluated for weight variation, content uniformity, folding endurance, thickness, surface pH, in vitro disintegration and in vitro dissolution. The optimized films which disintegrated in less than 30 sec, releasing 85-98% of drug within 2 minutes. The percentage release was varying with concentration of plasticizer and polymer. The films made with HPMC: PVA (1:2) released 96% of drug in 1 min, which was the best release amongst all. The objective of present study was to prepare and characterize Bilayer tablet formulation containing Metformin HCl in extended release matrix form and Pioglitazone HCl in immediate release form for the treatment of diabetes mellitus. Different formulations containing Metformin HCl were manufactured using 3 2 factorial designs. Influence of hydrophilic carrier, hydrophobic polymer on drug release was studied. Immediate release layer of Pioglitazone was optimized using different super disintegrants. All formulations were evaluated for percentage drug release. Optimization results indicated that release rate of Metformin is directly proportional to the levels of Eudragit S 100 and PEG 6000. Results confirmed that Bilayer tablet formulation containing extended release of Metformin HCl and immediate release of Pioglitazone HCl could be developed by using melt granulation technique. The objective of this research study was to optimize formulation and process variables affecting characteristic of nanosuspension in bead milling process. In this study, the practically water-insoluble telmisartan was nanoground by using top down method i.e. media milling method. Here the media used is ZnO 2 beads. A variety of surface active agents were tested for their stabilizing effects. Formulation factors evaluated were ratio of polymer to drug, whereas process parameters were milling time and concentration of ZnO 2 beads. Different concentration of stabilizers such as poloxamer 188, poloxamer 407, HPMC E 15, PVP K30 and combination of stabilizers were used for preparation of telmisartan nanosuspension. Responses measured in this study include particle size measurement, particle size distribution and zeta potential. A sustain release thermo reversible in situ gel of Moxifloxacin Hydrochloride using mucoadhesive polymer was prepared. Mucoadhesive polymer was used to obtain an ophthalmic delivery system with improved mechanical and mucoadhesive properties that will provide prolong retention time for treatment of ocular diseases. Developed formulations were evaluated for drug-excipient compatibility study, pH, Clarity, Gelation temperature study, Mucoadhesion properties and in-vitro release studies. Drug-excipient compatibility study was performed by FTIR technique.The individual IR spectra of the pure drug and polymers as well as the combination spectra of the drug and polymer were taken, which indicate no interaction between Moxifloxacin and polymers when compared with infrared spectrum of pure drug as all functional group frequencies were present. The values of other parameters obtained were in acceptable range. 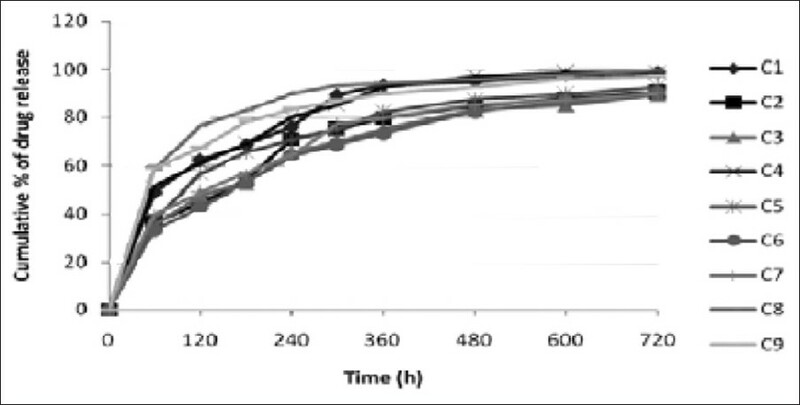 In vitro release tests revealed that 98% drug was released from the in situ gel containing 0.5% and 1.00% HPMC in 12 hr. provides prolonged release. Mucoadhesive drug delivery systems are those that provide intimate contact of the drug with the mucosa for an extended period of time. In present work, mucoadhesive chitosan microspheres of Levosalbutamol sulphate were prepared by Spray drying method. Formulations were characterized for various physicochemical attributes size, encapsulation efficiency, swelling ability, in vitro release study and mucoadhesion study by rat ileum. Through these parameters we conclude that the batch B 2 was found to be best mainly by mucoadhesion study and in vitro drug release. Mucoadhesion was found to be increased with incresed concentration of polymer and visa versa in case of drug release. Batch B 3 had also similar results with that of Batch B 2 . That's why here Batch B 2 was said to be the best batch with less polymeric content as compare to Batch B 3 . The objective of this study was to examine extensively the influences of formulation and process variables on the microparticles. The microparticles were generated by the spray-drying technique using polymer chitosan, mannitol along with L-leucine. The effects of various experimental parameters such as polymer concentration, inlet temperature, and feed flow rate on particle size and production yields were evaluated by means of experimental box-behnken design. Multiple regression analysis was carried out and response surfaces were obtained. Optimized formulation and check points batches were selected by feasibility and grid search. Experimental design it was evaluated that inlet temperature and polymer concentration influence on the production yield. Feed flow rate impact on particle size. Results showed that spray drying technique yield 985 to 4060 nm indicate micro size range and production yield was found in between 27.01-52.96%. The selection of appropriate parameters yielded spray-dried microparticles characterized by narrow dimensional distribution. In our present work, prepared microparticles using the spray-drying technique and systematically estimated their feasibility for the pulmonary delivery of microparticles by careful investigations of their characteristics and aerosolization properties. Spray drying technique yield optimum size for deposition beyond the narrow airway into the alveoli and suitable for respiratory deposition. The preparation of Tramadol-HCL spray-dried microspheres can be affected by the long drug recrystallization time. Polymer type and drug-polymer ratio as well as manufacturing parameters affect the preparation. The purpose of this work was to evaluate the possibility to obtain tramadol spray-dried microspheres using the Eudragit® RS and RL; the influence of the spray-drying parameters on morphology, dimension, and physical stability of microspheres was studied. The effects of matrix composition on microparticle properties were characterized by Laser Light scattering, differential scanning calorimetry (DSC), X-ray diffraction study, FT-infrared and UV-visible spectroscopy. The spray-dried microparticles were evaluated in terms of shape (SEM), size distribution (Laser light scattering method), production yield, drug content, initial drug loding and encapsulation efficiency. The results of X-ray diffraction and thermal analysis reveals the conversion of crystalline drug to amorphous. FTIR analysis confirmed the absence of any drug polymer interaction. The results indicated that the entrapment efficiency (EE), and product yield were depended on polymeric composition and polymeric ratios of the microspheres prepared. Tramadol microspheres based on Eudragit® blend can be prepared by spray-drying and the nebulization parameters do not influence significantly on particle properties. A new Hydrogel containing silver Sulfadiazine (SSD) was developed for enhanced burns wound healing. The hydrogel was prepared by cross-linking of PVA and Chitosan by freeze thawing method. Their gel properties, moisture retaining capacity, fluid uptake capacity, in vitro release study, in vivo burn healing effect were evaluated. Chitosan and PVA cross linking decreased gel fraction upto 70% determined the good gel properties. This cross linked hydrogel increased the Swelling ratio and Water vapour transmission rate (WVTR) which provides the sustained release of drug and moist environment for healing respectively. The hydrogel containing 7.5% of PVA, 0.75% of chitosan found to have increased gel strength, higher water vapour transmission rate and fluid uptake capacity suitable for faster healing of burns. This hydrogel also sustained the release of 1% SSD required for longer antimicrobial activity and found better in vivo burn healing capacity as compared to marketed preparation. Thus hydrogel containing 7.5% of PVA, 0.75% of chitosan and 1% SSD is a potential burns dressing with better gel properties and excellent burns healing capacity. Transdermal drug delivery influence consumer acceptance and marked increase in bioavailability of some drugs which undergoes hepatic first-pass metabolism. Fabrication of transdermal patch requires lots of attention regarding the amount of components used for it. Because of varied nature of polymer and plasticizer, transdermal patches have different properties and different drug release. This study is on the basis to evaluate the amount to be needed for fabrication of diclofenac transdermal patch. Study shows that Hydroxy Propyl Methyl Cellulose has great influence on transdermal patch, if it is used alone in combination with glycerin or PEG-4000 plasticizer. Transferosomes containing an anti-fungal agent were prepared by Rotary Flask Evaporation -Sonication method. Eight batches were prepared in triplicate and vesicle size of each batch was determined. Plackett-Burman Design was employed to identify significant formulation and process parameters affecting vesicle size. The amount of lipid and surfactant, volume of ethanol and hydration medium as well as hydration time significantly affect the vesicle size. Albendazole, a BCS class II drug, has poor dissolution characteristic. In order to enhance dissolution nanocrystals were prepared by antisolvent precipitation process using PVP K-30(0.05%,0.1%,0.2%,0.4%) as stabilizer. The process was optimized in terms of concentration of stabilizer(PVP K 30) in order to enhance dissolution and obtain stable particles with a small mean particle size. Nanocrystals were characterized with respect to particle size, in vitro dissolution and X-ray diffraction pattern. Decrease in particle size of nanocrystals was observed with increase in concentration of stabilizer. 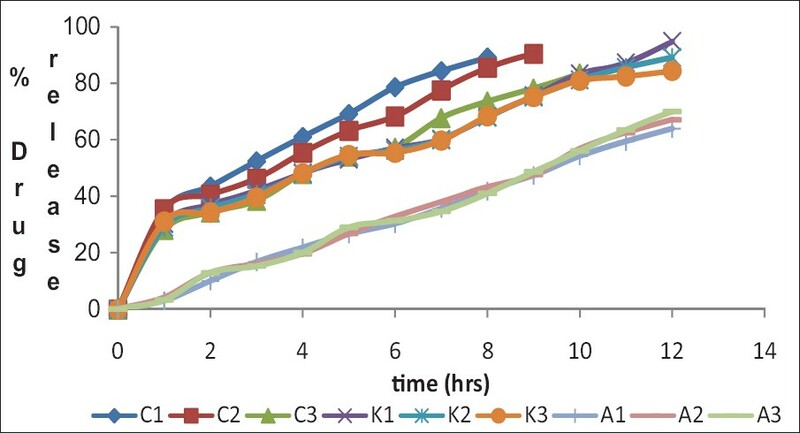 Dissolution of nanocrystals also improved with increase in concentration of PVP K-30. Crystalline state evaluation before and following particle size reduction was conducted through XRD to denote any possible transformation to an amorphous state during process. The present study was aimed to increase the solubility of the poorly water soluble drug Telmisartan by using Surface solid dispersion (SSD) made of polymers like Poloxamer 407, PEG 6000 by Solvent evaporation method. The drug was solubilized by surfactants and/or polymers then adsorbed onto the surface of extremely fine carriers to increase its surface area and to form the SSD which give the more Surface area for absorption of the drug. A 2 2 full factorial design was used to investigate for each carrier the joint influence of formulation variables: Amount of carrier and adsorbent. 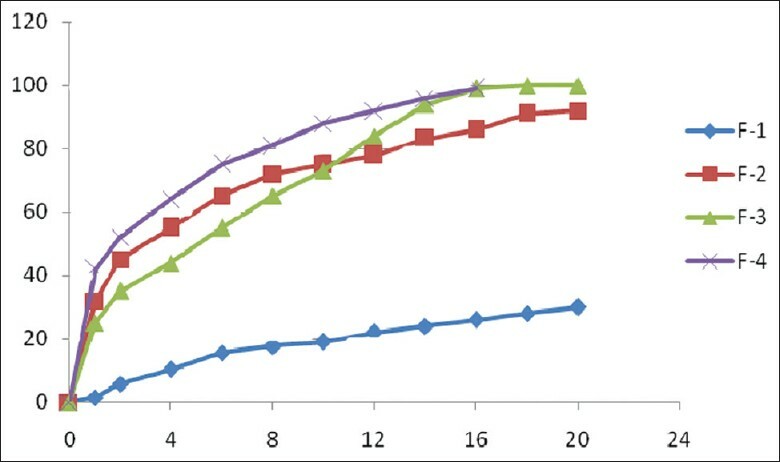 Saturation solubility studies shows the improvement in solubility of drug batch SSD 8 give more solubility improvement than the other batch, in-vitro dissolution of pure drug, physical mixtures and SSDs were carried out in that SSDs were found to be effective in increasing the dissolution rate of Telmisartan in form of SSD when compared to pure drug. Also FT-IR spectroscopy, differential scanning calorimetry and X-ray diffractometry studies were carried out in order to characterize the drug and Surface solid dispersion. Furthermore, both DSC and X-ray diffraction showed a decrease in the melting enthalpy and reduced drug crystallinity consequently in SSDs. However, infrared spectroscopy revealed no drug interactions with the carriers. Microemulsion which act as a carrier for drug having poor water solubility, were formulated by the use of excipients having safety of administration and solubility of drug component. The phase study was carried out using isopropyl myristate, cremophor-el, propylene glycol and water with different ratios of components. Microemulsion region was chosen on basis of area covered. The % oil and % surfactant were selected as the independent factors and particle size and viscosity were selected as the dependent factors for the 2 2 Full Factorial Design. The optimized formulation showed the overcoming of the dissolution barrier helping in the formulation and administration. Solution layering technique was used to prepare pellets of Salbutamol Sulphate. A multiparticulate system was prepared with pH independent and pH dependent coatings, and evaluated as pulsatile drug delivery system. Salbutamol sulphate release was studied from methacrylate coated pellets from non pareils. 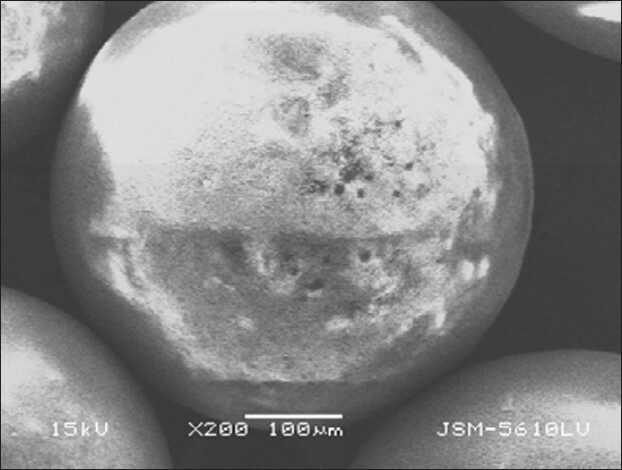 Morphology was studied using Scanning Electron Microscopy for the characterization of prepared pellets. Combination of Eudragit RSPO (pH independent) and Eudragit L100 (pH dependent) was used for coating of the pellets. Different concentrations of this polymeric combination were loaded on to the drug-loaded pellets. The aim of this study was to investigate the effect of physicochemical properties of the polymers on the release profile of Salbutamol sulphate from the pellets dosage form. The in-vitro study suggested that Eudragit RSPO and Eudragit L100 at 10% coating level led to an optimum pulsatile release behavior. The coated pellets prepared by solution layering technology successfully released drug after specific lag time indicating pulsatile drug delivery. It was revealed that Eudragit RSPO has the effect to retard drug release. The results generated in this study showed that proper selection of polymeric materials based on their physicochemical properties is important in designing pellets dosage form with suitable dissolution profile. Spray formulation can minimize pain and irritation experience during the application of conventional dosage forms. Econazole Nitrate is an active ingredient of the aerosol concentrate to be used for twice-daily application because of its long durability in the superficial layers of the fungal infected skin. The aim of this study is preliminary investigation of Econazole Nitrate spray by varying the concentrations of different constituents of the spray. The ratios of Propylene glycol (PG) and isopropyl myristate (IPM) were selected as independent variables in 2 2 full factorial designs, keeping the concentration of solvent, co-solvent and propellant LPG constant. Aerosol also contained Ethanol as solvent and Isopropyl alcohol as co-solvent. All ingredients of the aerosol were packaged in an aluminum container fitted with continuous-spray valves. Physical properties evaluated for the Econazole Nitrate spray included delivery rate, delivery amount, pressure, minimum fill, leakage, flammability, spray patterns, particle image and plume angle. Glass containers were used to study incompatibility between concentrate and propellant due to the ease of visible inspection. Isopropyl myristate at lower concentrate showed turbidity, while at high concentration it met the requirements for aerosol and produced Econazole Nitrate spray with expected characteristics. Sustained release matrix tablet is a delivery system by which the drug can be delivered at a controlled rate for long period of time. The present study aims at formulation, evaluation and optimization of captopril matrix tablets. A 3 2 full factorial design was adopted and all 9 batches were prepared by wet granulation method. Prepared granules and tablets were evaluated for precompression and postcompression characteristics respectively. Check point analysis was applied to the observations and the formula of the tablet was optimized. 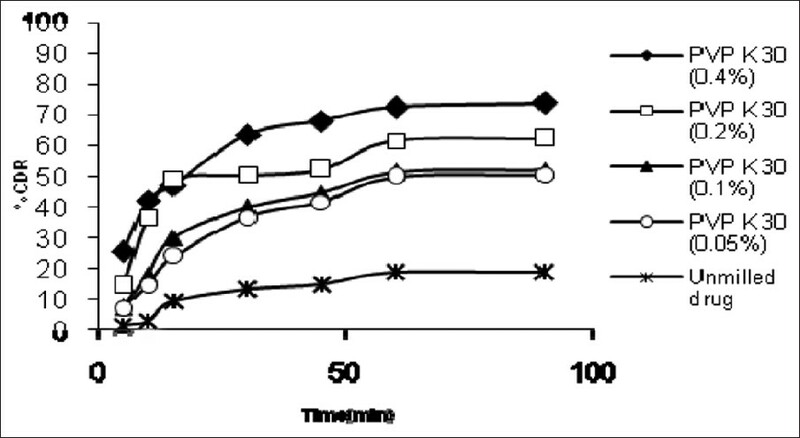 Optimized formula, F6 showed zero order drug release kinetics for the time period of 24 hours i.e. 17.55% release at the end of 2 hours, 53.4% release at the end of 12 hours and 100.24% release at the end of 24 hours. 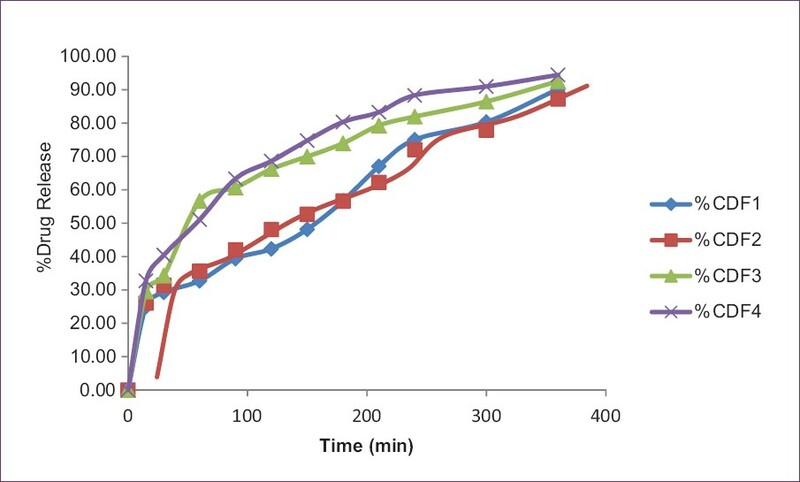 The results revealed that concentration of matrix forming agent and solution of granulating agent significantly affected in vitro drug release profile. Losartan potassium is an angiotensin II receptor antagonist readily absorbed from the GIT, following oral administration. It has low bioavailability as it undergoes extensive first pass metabolism and low elimination half-life. The present study was aimed at studying sustained release behaviour of the drug using hydrophilic and hydrophobic polymers and to optimise using a 32 full factorial design. Eudragit and HPMC were used to evaluate the effect of hydrophilic and hydrophobic polymers on the release pattern of the drug. 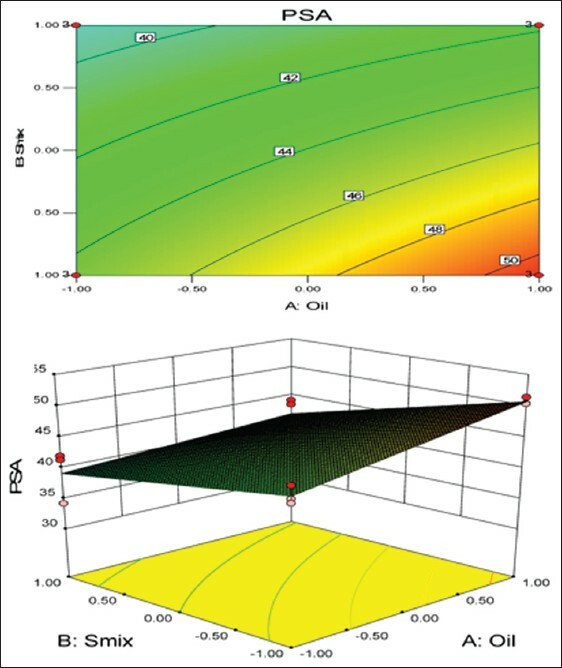 A full factorial was implemented at 20, 30 and 40% concentration of hydrophilic polymer and 2.5, 5 and 7.5% of hydrophobic polymer correlating with the release behaviour. Process variables were investigated and the results showed excellent adaptability in releasing drug over prolonged periods. Based on the results, it was found suitable to formulate a dosage form using optimum concentration of hydrophobic polymer along with hydrophilic polymer to vary the release behaviour for over 12 hours. It is a challenge to develop the optimum dosage form of poorly water-soluble drugs and to target them due to limited bioavailability, intra and inter subject variability. In this investigation, mucoadhesive microemulsion of curcumin was developed by water titration method taking biocompatible components for intranasal delivery and was characterized. Nasal ciliotoxicity studies were carried out using excised sheep nasal mucosa. in vitro release studies of formulations and PDS were performed. 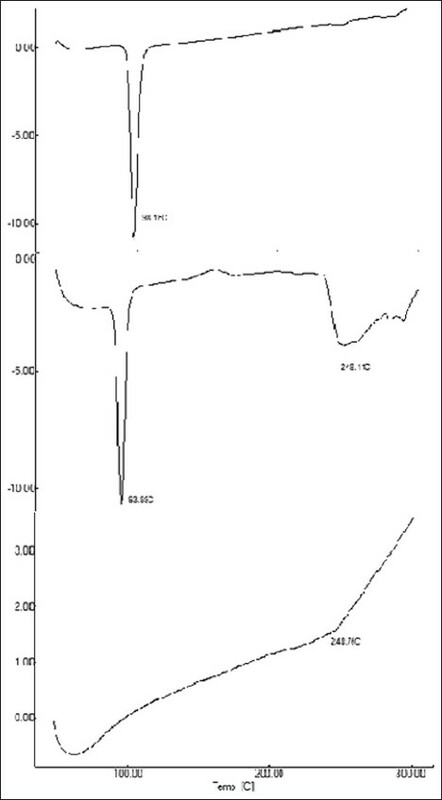 Labrafil M 1944 CS based microemulsion was transparent, stable and nasal non-ciliotoxic having particle size 12.32±0.81nm (PdI=0.223) and from kinetic modeling, the release was found to be Fickian diffusion for mucoadhesive microemulsion. The present investigation described the influence of viscosity and drug: Polymer ratio on Hydrochlorothiazide release. Floating microspheres loaded with hydrochlorothiazide were prepared by Emulsion solvent evaporation method. The prepared microspheres were evaluated by micromeritics properties, in vitro drug release, floating ability and drug entrapment efficiency. The objective of this work was to apply central composite experimental design to investigate main and interaction effect of formulation parameters in optimizing novel fast disintegration tablets formulation using pullulan as diluents. Face centered central composite experimental design was employed to optimize fast disintegration tablet formulation. The variables studied were concentration of diluents (pullulan, X1), superdisintigrant (sodium starch glycolate, X2), and direct compression aid (spray dried lactose, X3). Tablets were characterized for weight variation, thickness, disintegration time (Y1) and hardness (Y2). 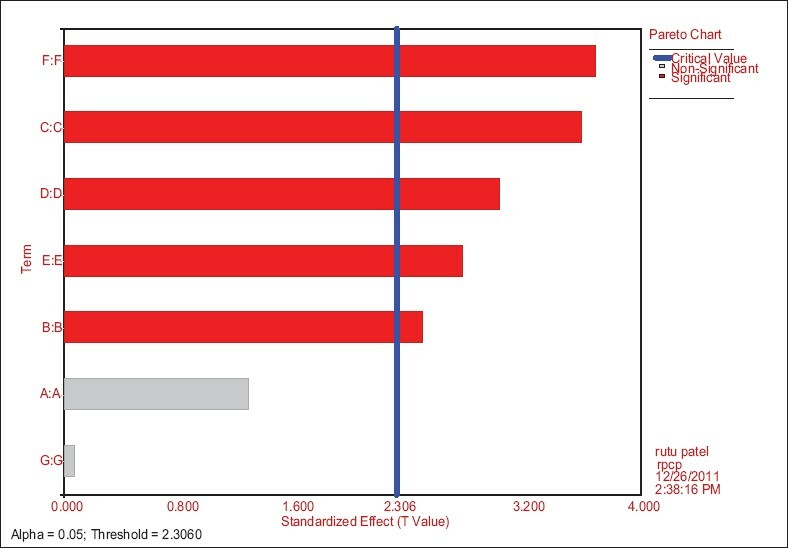 Good correlation between the predicted values and experimental data of the optimized formulation methodology in optimizing fast disintegrating tablets using pullulan as a diluent. The purpose of the present work was to design and evaluate the once daily sustained release matrix type gastro-retentive floating tablet of Quetiapine Fumarate base on hydrophilic matrices of HPMC, sodium CMC and Carbopol. Sodium bicarbonate was incorporated as a gas-generating agent to give buoyancy. In-vitro drug release studies were performed in pH 1.2 buffer using USP type II paddle at 50 rpm. 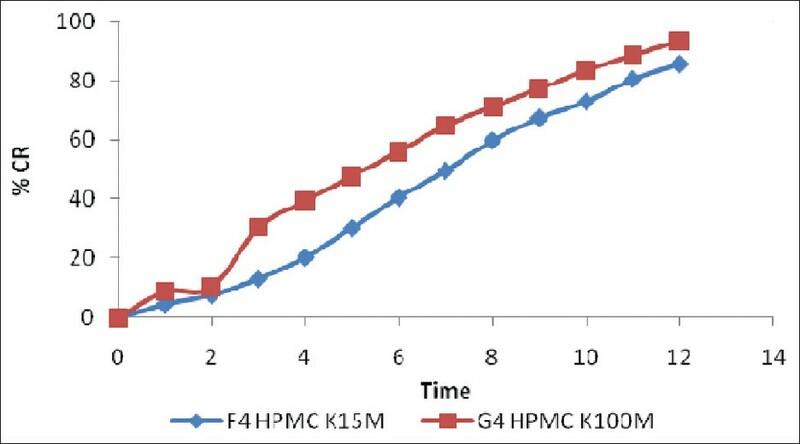 The release rate of drug decreased with increasing polymer proportion of HPMC K15M from 20 to 60 mg. Formulation with desired drug release achieved with combination of sodium CMC and K15M in ratio of 1:3. The drug release mechanism was predominantly found to be Non-Fickian diffusion and Higuchi controlled. Metoprolol succinate is a selective beta-adrenergic receptor blocker useful in treatment of hypertension, angina and heart failure. The purpose of the present work was to design and evaluate controlled release matrix type tablet of Metoprolo succinate using HPMC K15M and Eudragit (RLPO and RSPO) as a matrix forming agents. Effect of various polymer alone and combinations were studied in pH 1.2 buffer using USP type II paddle at 50 rpm. HPMC was used to form firm gel with Eudragit polymer. 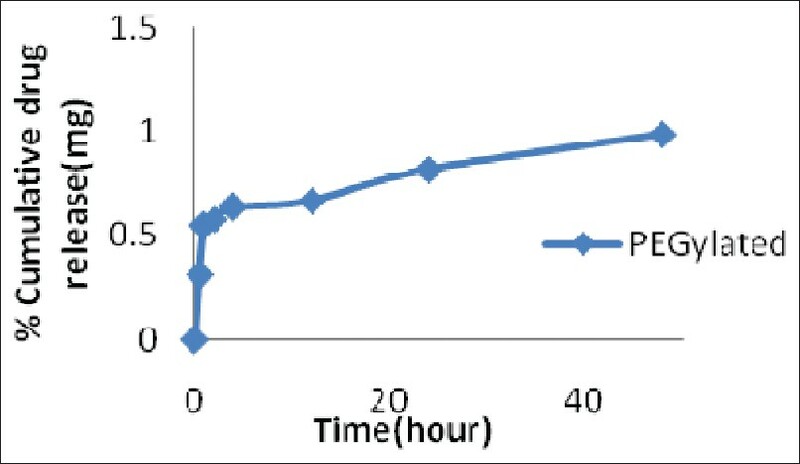 Formulation with Equal proportion (1:1) of Eudragit RSPO and RLPO showed optimum drug release t50 =7 hrs and t100 =16 hrs indicate optimum permeability for drug release from matrix. The drug release mechanism was predominantly found to be Non-Fickian diffusion controlled. Mesoporous silica nanoparticles (MSNs) are introduced as chemically and thermally stable nanomaterials with well-defined and controllable morphology and porosity. It is shown that these particles possess external and internal surfaces that can be selectively functionalized with multiple organic and inorganic groups. Silica nano-particles were synthesized by chemical methods from tetraethylorthosilicate (TEOS), methanol (CH3OH) and deionised water in the presence of sodium hydroxide as catalyst at 80°C temperature. The nature and morphology of particles was investigated by scanning electron microscopy (SEM), N2 adsorption/desorption method using BET instrument and X-ray diffraction (XRD). Silica nanoparticles are applicable to a wide range of therapeutic entities from small molecule to peptides and proteins including hydrophobic and hydrophilic entities. Drug loading does not require chemical modification of the molecule; there are no changes in the drug structure or activity after loading and subsequent release of the drug. Thus, well suited to solve formulation problems associated with hydrophobic drugs such as peptide and protein drugs like cyclosporine A. Silica nanoparticles improved the solubility of poorly water soluble drugs and enhanced the absorption and bioavailability of these compounds. The compound ibuprofen, 2-(4-isobutylphenyl) propionic acid, has been known e.g. from Martindale, the Extra Pharmacopoeia, 28 th edition, 1982, p.256, as a drug which had anti-inflammatory and analgesic properties. It is used for the treatment of rheumatoid arthritis or other inflammatory diseases of joints, soft tissue rheumatism and gout. Ibuprofen, because of its analgesic properties, has been widely used as anodyne, e.g. against pain or discomfort associated with headache, toothache or menstruation. A medication suitable to combat acute pain is demanded to display its effects fast which action, in turn, is only achieved by a quick release and good bio-availability of the active-ingredient. It is for the commercial forms in particular that the conditions of preparation must be strictly observed, as minor alterations in production procedures such as mixing, pressure of compression and type of machine will affect the physical properties of the particles of he active ingredient and will deteriorate its bio-availability. It is an object of this presentation to provide a medicament that can be readily taken that contains an active amount of ibuprofen in a carrier, that is simple to prepare and that will quickly display a high activity. Artemether and Lumefantrine capsules are indicated for the treatment of P. falciparum malaria cases resistant to both chloroquine and sulphadoxine, pyrimethamine combination. Both artemether and lumefantrine act as blood schizontocides. Artemether is a sesquiterpene lactone derived from artemisinin. Artemisinin is a compound derived from the sweet wormwood plant and has been used for centuries in traditional Chinese medicine to treat fever. Lumefantrine is a synthetic aryl-amino alcohol antimalarial (quinine, mefloquine and halofantrine are members of the same group). Artemether is absorbed fairly rapidly with peak plasma concentrations reached about 2 hours after dosing. Absorption of lumefantrine, a highly lipophilic compound, starts after a lag period of up to 2 hours, with peak plasma concentration about 6-8 hours after dosing. In order to overcome this problem, we have observed that when the drug is given in the soft gelatin dosage form, the bioavailability of the drug is increased. Thus, increasing the absorption of the drug and peak plasma concentration is reached earlier then the conventional dosage form. The objective of this study is to formulate ketoprofen loaded microspheres of Acrycoat S100 by an o/w emulsion solvent evaporation method. It potently inhibits the enzyme cyclooxygenase resulting in prostaglandin synthesis inhibition. Ketoprofen causes an irritation in the gastrointestinal mucous membrane and possesses a bitter taste and aftertaste. The half-life in plasma is about 1-2hrs. This makes ketoprofen a very good candidate for the formulation of controlled release dosage forms. Ketoprofen microspheres help to protect the gastric mucous membrane from drug irritation and to mask its taste. 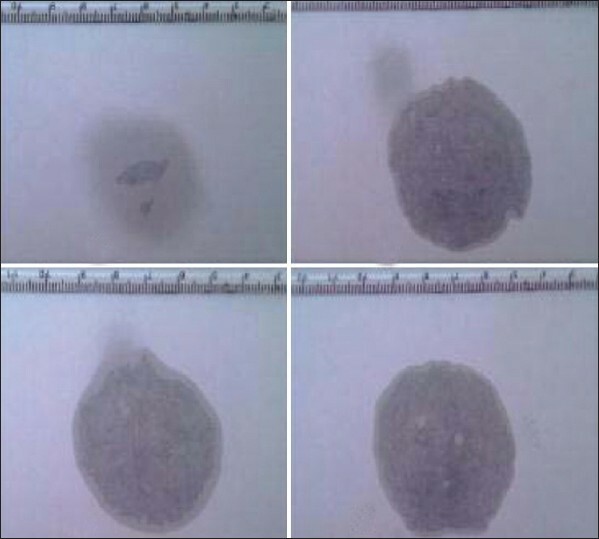 The prepared microspheres were evaluated for micromeritic properties, particle size, effect of surfactant concentration, percentage yield, incorporation efficiency, drug polymer compatibility (IR and DSC study), scanning electron microscopy and in vitro drug release. The microspheres produced exhibited good encapsulation efficiencies and micromeritic properties. Encapsulation efficiency of microsphere is around 78%. The mean diameters of microspheres were found in required micrometer range. The results of optimized formulations showed a narrow size distribution and smooth surface. The DSC and the FTIR analysis showed the absence of any potent incompatibility between the drug and the polymer. In-vitro release showed 86.4% drug release after 12 hours. Results of present study suggest that Acrycoat S100 loaded microsphere of ketoprofen can be successfully designed to develop sustained drug delivery system. The solvent evaporation method is a suitable technique for the preparation of Acrycoat S100 microspheres for controlling the release of Ketoprofen for a prolonged duration. The present study was aimed to increase the solubility of the poorly water soluble drug benfotiamine using hydrophilic polymers (PVP K-30 and HPMC E4). Solid dispersions were prepared by kneading method. Phase solubility study, in-vitro dissolution of pure drug, physical mixtures and solid dispersions were carried out. PVP and HPMC were found to be effective in increasing the dissolution of Benfotiamine in solid dispersions when compared to pure drug. FT-IR, differential scanning calorimetry and X-ray diffractometry studies were carried out in order to characterize the drug and solid dispersion. To conclude that, the prepared solid dispersion of PVP-30 may to effectively used for the enhancement of solubility of poorly water soluble drugs such as benfotiamine. The objectives of this research were to prepare and characterize inclusion complexes of Nitrazepam with Hydroxypropyl-β-cyclodextrin (HPβCD) and Sulfobutyl ether β-cyclodextrin (SBEβCD) to study the effect of complexation on the dissolution rate of Nitrazepam, a water-insoluble drug. The phase solubility profile of Nitrazepam with Hydroxypropyl- β-cyclodextrin and Sulfobutyl ether β-cyclodextrin was an AP-type, indicating the formation of 2:1 stoichiometric inclusion complexes. 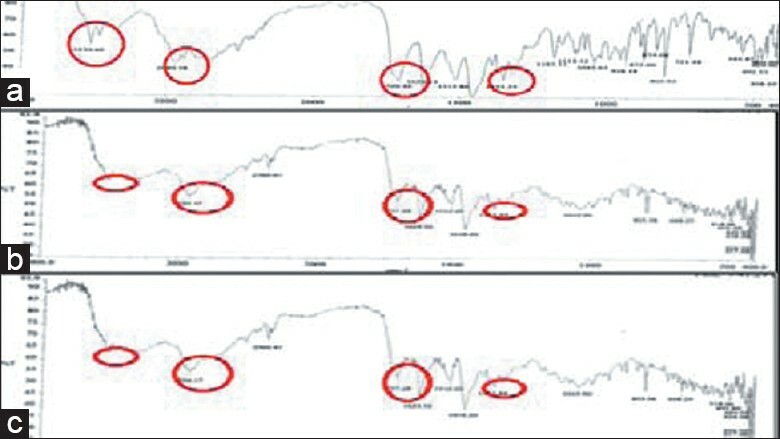 Gibbs free energy values were all negative, indicating the spontaneous nature Nitrazepam solubilization and their value decreased with increase in the cyclodextrin concentration, demonstrating that the reaction conditions became more favorable as the concentration of cyclodextrins increased. Complexes of Nitrazepam were prepared with cyclodextrin using various methods such as physical mixing, kneading, spray-drying and lyophilization. The complexes were characterized by Differential scanning calorimetry, Fourier-transform infrared, scanning electron microscopy and powder X-ray diffraction studies. These studies indicated that a complex prepared by lyophilization had successful inclusion of the Nitrazepam molecule into the cyclodextrin cavity. Complexation resulted in a marked improvement in the solubility and wettability of Nitrazepam. Among all the samples, a complex prepared with Sulfobutyl ether β-cyclodextrin by lyophilization had the greatest improvement in the in vitro rate of Nitrazepam dissolution. The mean dissolution time for Nitrazepam decreased significantly after preparing complexes. The similarity factor indicated a significant difference between the release profiles of Nitrazepam from complexes, physical mixtures and plain Nitrazepam. To conclude that, the tablets containing complexes prepared with Cyclodextrins had significant improvement in the release profile of Nitrazepam as compared to tablets containing Nitrazepam without cyclodextrin. The present investigation was undertaken with the objective of formulating mouth dissolving film(s) of the antiemetic drug Domperidone to enhance the convenience and compliance by the elderly and pediatric patients. Domperidone is a drug of choice in case of nausea and vomiting produced by chemotherapy, migraine headaches, food poisoning and viral infections. It causes dopamine (D2 and D3) receptor blockage both at the chemoreceptor trigger zone and at the gastric level. It shows high first pass metabolism which results in poor bioavailability (10-15%). In view of high first pass metabolism and short plasma half-life it is an ideal candidate for rapid release drug delivery system. The solid dispersions of Domperidone were prepared with the use β-cyclodextrin in various ratios (1:1, 1:2, 1:3) and solubility study was performed to determine the ratio in which solubility of Domperidone was highest (1:3). The selected solid dispersions were then utilized for the preparation of film by solvent casting method utilizing HPMC E15 as a film forming agent and PEG-400 as plasticizer. Five formulae were prepared and were evaluated for their in vitro dissolution characteristics, in vitro disintegration time, and their physico-mechanical properties. The promising film (F1) showed the greatest drug dissolution (more than 75% within 15 min), satisfactory in vitro disintegration time (45 sec) and physico-mechanical properties that are suitable for mouth dissolving films. The objective of present work was to prepare microspheres of montelukast sodium using a natural polymer- chitosan by spray drying method by using glutaraldehyde as a cross linking agent. The microspheres were characterized for size, shape, dissolution, swelling and mucoadhesion. 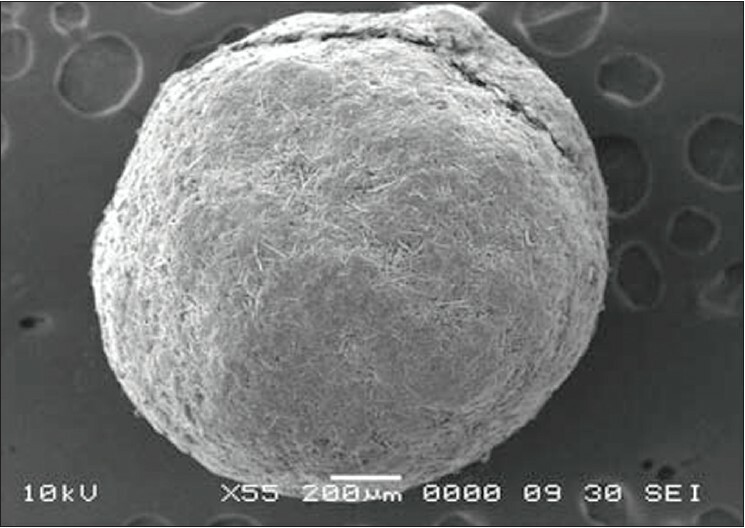 It was observed that, all microspheres were spherical in shape with narrow size distribution. Microspheres had mean particle size of 7-12 μm, with % encapsulation efficiency of 78-86%. The % yield was 32-49% and drug load was 48-53%. With the increase in proportion of chitosan in formulation mucoadhesive strength was increase and also increased in particle size of microspheres. As the drug:polymer ratio increase drug loading was increase and % encapsulation efficiency was also increase. Tamoxifen Citrate (TC) is an estrogen receptor antagonist and drug of choice for hormone sensitive breast cancer. Solid Lipid Nanoparticles loaded with TC were prepared by High Shear Homogenization followed by Ultrasonication. The aim of the present work is to study the effect of four different Solid Lipids and three Surfactants on Formulation and Stability of SLN. They were characterized for Particle size, Polydispersity Index and Zeta Potential by Zetasizer Nano. SLN prepared by Solid Lipid Compritol 888 (Glyceryldibehenate) and Tween 80 (1%) showed desired Particle Size of 206.9 nm, PDI of 0.046 and Zeta Potential of 9.32 mV. Cilnidipine, a calcium channel blocker having neuroprotective action and BCS Class II drug, hence formulating in Microemulsion will increase solubility, absorption and bioavailability. 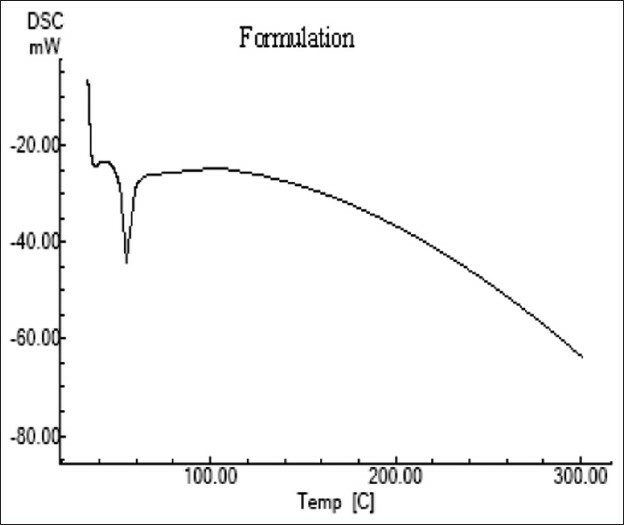 The formulation was prepared using titration method by tocotrienol, tween 20 and transcutol HP as oil, surfactant and co-surfactant and characterized for dilutability, dye solubility, assay (98.39±0.06), pH (6.6±1.5), Viscosity (98±1.0 cps) and Conductivity (0.2±0.09 μS/cm). The formulation was optimized on basis of percentage transmittance (99.269±0.23 at 700 nm), Globule size (13.31±4.3 nm) and zeta potential (-11.4±2.3 mV). Cilnidipine microemulsion was found to be stable for 3 months. The aim of the present work is to formulate and evaluate in situ oral topical gels of poorly water soluble drug Bifonazole based on temperature induced systems for the treatment of oral candidiasis. Bifonazole is poorly water soluble and low permeable drug means it's belongs to BCS Class IV. Due to its poor water solubility, it necessary to enhance solubility in water by make complex with Beta- Cyclodextrin (Drug to βCyclo Dextrine ratio is 1:1). After in situ gel preparation done by using Poloxamer (10% and 15%w/w) along with carbopol 934 (0.2 to 1.0% w/w) and Bifonazole - β CD complex (1%w/w). The formulations were evaluated for physiochemical parameter, gelation Temperature, viscosity, gel strength, content uniformity mucoadhesive force, Diffusion Study. Due to very less bioavailability (20%) of Rosuvastatin calcium, an attempt was made to develop and optimize microemulsion formulation. Capmul MCM, Tween 20 and PEG 400 were selected as oil, surfactant and cosurfactant respectively as the drug is having higher solubility in them. 3:1% w/w S:CoS was selected as it gave higher microemulsion area. Optimized batch (ME-1) was selected having 5% Capmul MCM, 50% Tween 20:PEG 400 and 45% water based on evaluation parameters globule size, zeta potential, PDI, % transmittance.